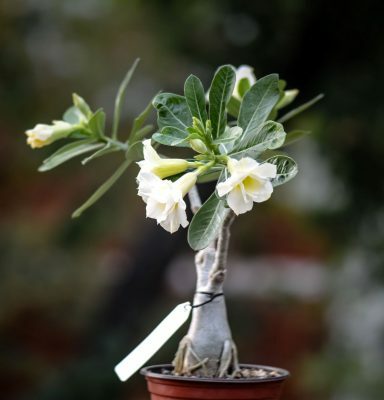 Easy steps : How to plant, grow and care for Adenium obesum. 1. Submerge the seed for 1 to 4 hours in lukewarm, room temperature water. You can use warmer water too, it’s just important that you don’t use boiling hot water. This will make the germination process faster for a day or two. Don’t worry if the seed doesn’t sink. 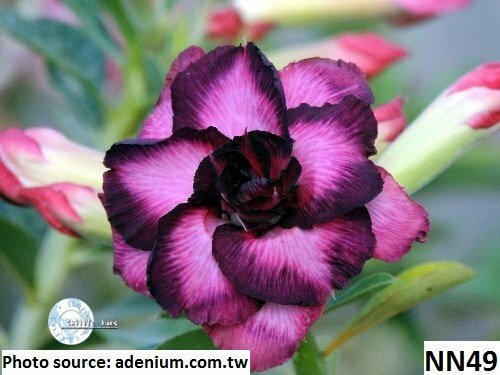 Adenium seed usually floats even after sinking it in water, as opposed to many other seeds. 2. You can use any kind of substrate, as long as the drainage is good. Coconut turf is ideal, just as is cactus soil that you can buy. Standard garden soil can do well at the beginning, but later on and during winter, it may become problematic due to poor drainage. 3. Plastic cups can serve you well as flowerpots during the first few months, and there’s no need for bigger pots. The only important thing is to cut out holes at the bottom. The depth of 1.5-2 inches (4-5 cm) is more than enough for the first few months of growth. 4. First you need to water the substrate, so it can lie down; and then afterwards put the seed HORIZONTALLY on soil and DO NOT PUSH IT. 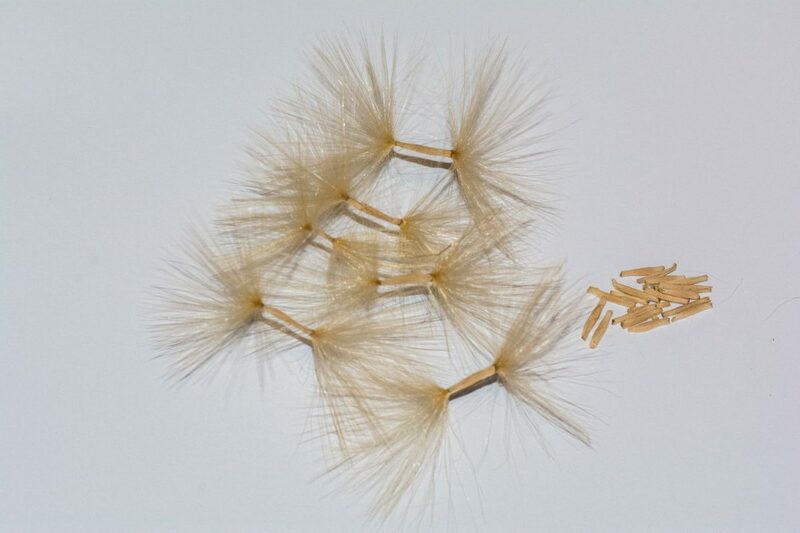 Then cover the seed with a very thin layer of substrate, do not go over 0.2 inches (half a centimeter). Water it again and be careful, as the water stream can move the seed or uncover it. Sprayers will be extremely useful for this task. Feel free to water it, until the water starts flowing from the flowerpot/plastic cup. 5. Leave the flowerpot for a few minutes for the water to drain. 6. Keep the substrate MOIST during germination. You can cover the plastic cup with nylon and tie it with a rubber band, to keep the moisture at a high level. This is THE MOST IMPORTANT STEP for germination as it affects the germination percentage the most. The soil shouldn’t dry until the seed germinates, and it has to be damp (but not completely covered by water). I’ve personally come to the conclusion that the best combination for the germination process consists of cake cover, underneath which I put small pots or plastic cups. In this case, you don’t need to put nylon covers over them, because the cake cover will provide more than enough moisture and air. Another solution may be a plastic fast food box, with a useful cover to keep the moisture. In this case, you can plant your seeds directly in those boxes, provided that each seed is at least 1 to 1.2 inches (2.5 to 3cm) apart. 7. Uncover the nylon every day, so that the fresh air can come in. That nylon-pause should last 10-20 minutes, and then cover it again. If the substrate doesn’t dry off during germination, and is constantly moist, that means that you did a good job. But, if you notice that the substrate is dry on the surface, be sure to spray it a bit, because the seed shouldn’t be in a dry substrate. 8. Your flowerpot has to be on a well-lit place, but UNDER NO CIRCUMSTANCES exposed to direct sunlight, because the seed will overheat in hot soil, and after germination, it will burn out. Ideal temperature is up to 77 to 95°F (25 to 35°C). It’s not a problem if that temperature drops to 62-64°F (17-18 °C) over night, but it’s desirable that it’s over 77°F (25°C) during the day. The seed will germinate even in a room of 70-71°F (21-22 °C) but that will extend the germination time, and probably decrease germination success rate. 9. 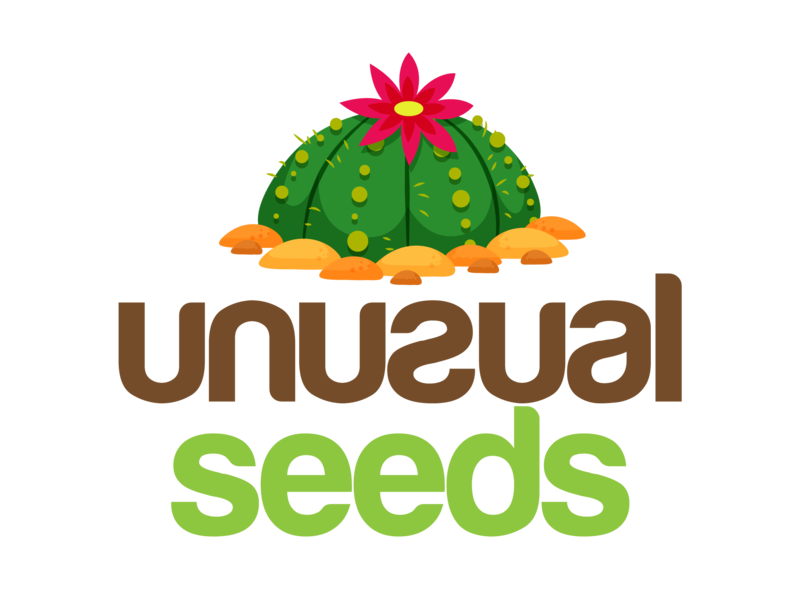 The largest number of seeds will germinate between days 3 and 5, if you’ve provided optimal conditions. If there wasn’t enough moist or the temperature didn’t go over 77°F (25°C), germination will last longer. It shouldn’t last longer than 10 days. 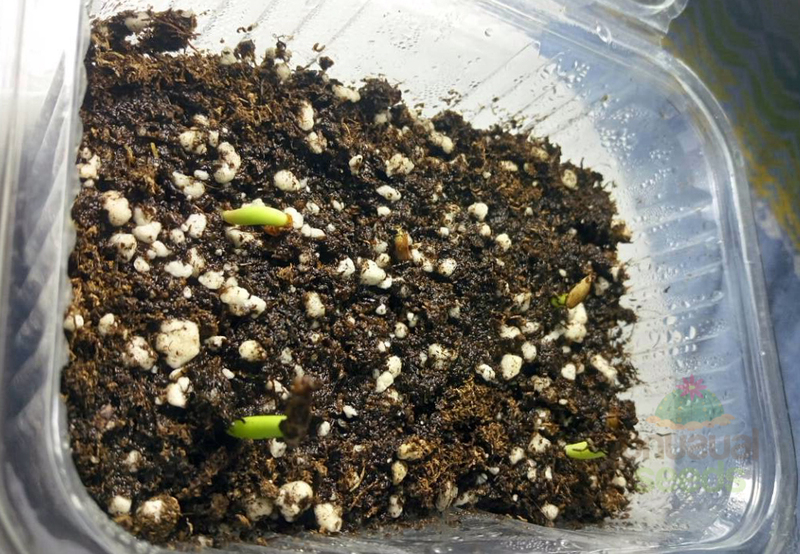 There are examples when the seed has germinated even after a few months, but that doesn’t happen very often. 10. When the seed germinates, you can leave the nylon cover for a couple more days. Feel free to take it off later on, and don’t cover the seed afterwards. 11. 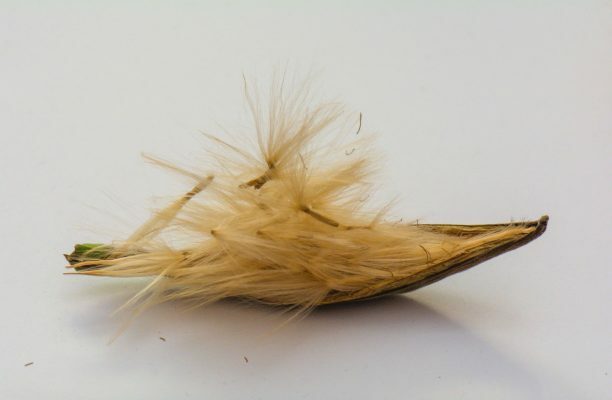 When the seed germinates, it will usually dispose of the seed shell on the leaves on its own, but it’s stuck sometimes, and the leaves can’t open. If it doesn’t fall off in 2-3 days, feel free to GENTLY remove it, otherwise the seedling may die off. 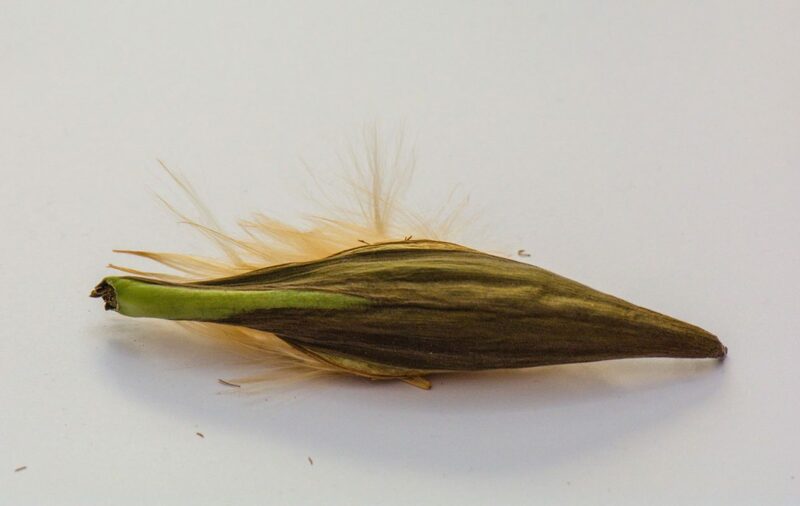 This can be done easily by spraying the plant first, so that the shell softens, and then gently, with your nail, push the shell FROM THE BOTTOM, and it will easily slide off. If you pull the shell from the upside, you can easily break the leaves. Even if you do this, don’t throw away the plant; instead give it a chance to create some new ones. 12. 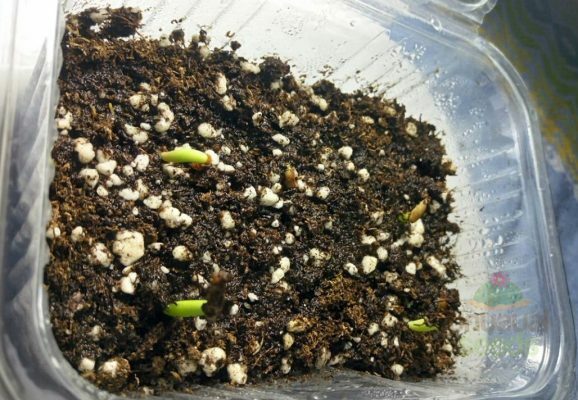 During the first 2-3 months after germination, the seedlings need to be under a strong light and on a warm spot, up to 100°F (38°C), but under no circumstances should you expose them to direct sunlight. Only after 2-3 months you can slowly let your plant get used to the sun, but first expose it for an hour or two early in the morning or late in the evening, when the sunlight is not too strong. The most important requirement for fast growth in young plants in an ample amount of light and warmth. If you sow during winter, when the days are shorter, try to put the plant close to a powerful light bulb or next to a window. That should be the window which gets the most light during the day. If the plant doesn’t get enough light, it will grow in height, not width. Approximately after 2-3 months, let the plant gradually get accustomed to direct sunlight, but don’t let it spend the day under direct sunlight during the early phase. Try to leave it at a spot where they will get 1-2 hours of light during first 5-6 months. 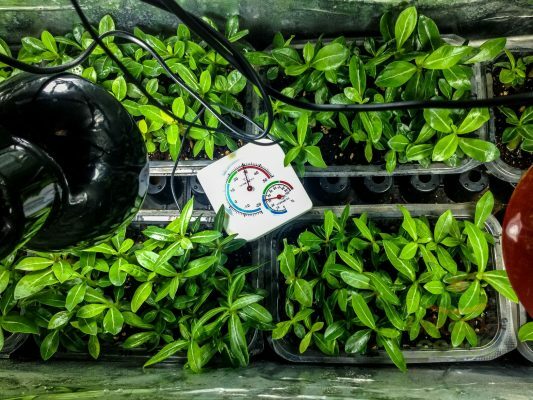 After that, you can leave the plant under the sunlight for longer periods of time, and after the first year it can be under sunlight all the time (provided that it was accustomed to it beforehand). Warmth is extremely important and the ideal temperature is 77 to 95°F (25 to 35°C). When the daily temperature exceeds 95°F (35°C) it’s desirable to move the plant away from direct sunlight, because it can cause burns. 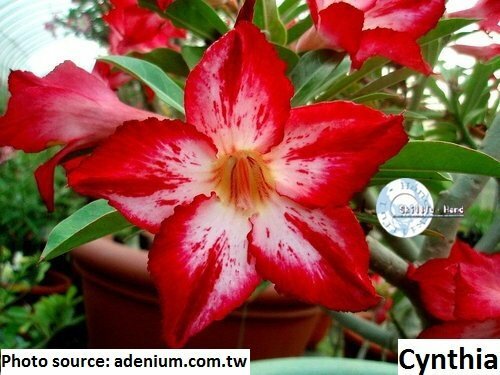 When it comes to low temperatures, Adenium can tolerate as low as 50°F (10°C), so if the temperature during night starts falling below that, it’s time to move the plant into the house. Older plants are somewhat more resistant and they will survive a couple of nights below 50°F (10°C). However, it’s for the best to take them inside. 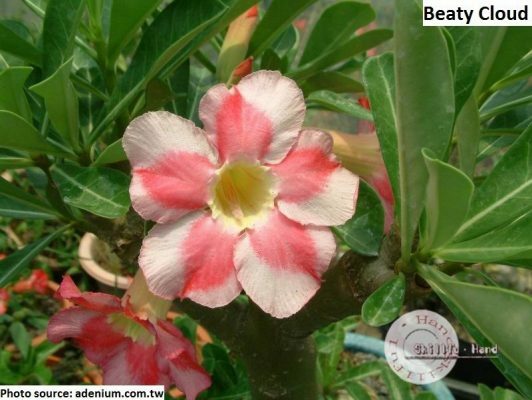 Although it is thought to be a desert plant, Adenium likes to get plenty of water. The hotter and sunnier the weather, the more water it needs. The most important thing is the drainage of soil. If the drainage is good, and the excess of water flows out fast, you can even water it daily. On the other hand, it’s a safe bet to water it every 2-3 days during summer. You should simply wait for the substrate to dry, then water it, be it once a day or once a week. If the soil has poor drainage, and the root is constantly in the water, it will rot, and that will be the end of it. When it comes to young plants up to a couple of months of age, they cope with the excess of water much better, so do not allow the substrate to dry completely. 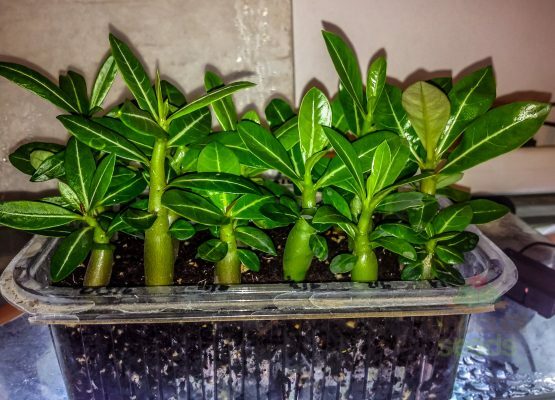 Adenium will thrive in almost any substrate, as long as it’s light and combined with good drainage, so that the roots can breathe. A good option would be to use a cactus mix of a kind, which contains quartz sand. You can use any sand, perlite, broken brick or anything with granulation 0.07-0.15 inches (2-4 millimeters), which will make the drainage better and mix it with garden soil bought in a store. Coconut peat is also a great choice, but be aware of the fact that it doesn’t contain any nutritious materials, so you must fertilize the soil on a weekly basis. Adenium reacts well to topdressing, but a simple rule is of importance when it comes to these plants: it’s better to use topdressing often and less in quantity. That means that when you buy a fertilizer, you should dilute the fertilizer for a half less or even more than it was indicated on the packing. The best option is equal fertilizer, with an equal quantity of macroelements NPK with an addition of micro-elements such as magnesium and calcium. For an example, NPK 10-10-10 would be a good choice. If you don’t find something like that, choose the fertilizer with more N and P elements. N is for plant growth and P is for blooming and strengthening the root system. 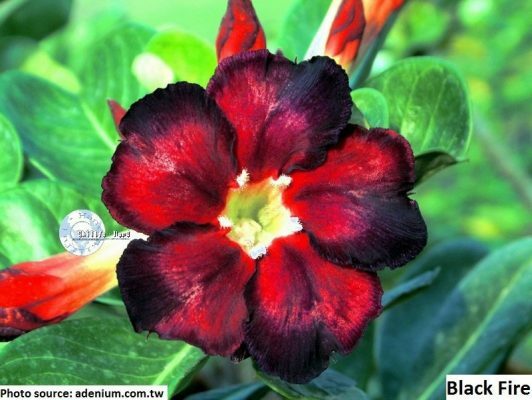 The most often cause of Adenium’s death is the result of a combination of cold weather and over-watering. If low temperatures are frequent for your countries during winter nights and there are no high temperatures over the day; you can even decrease watering to once a month. 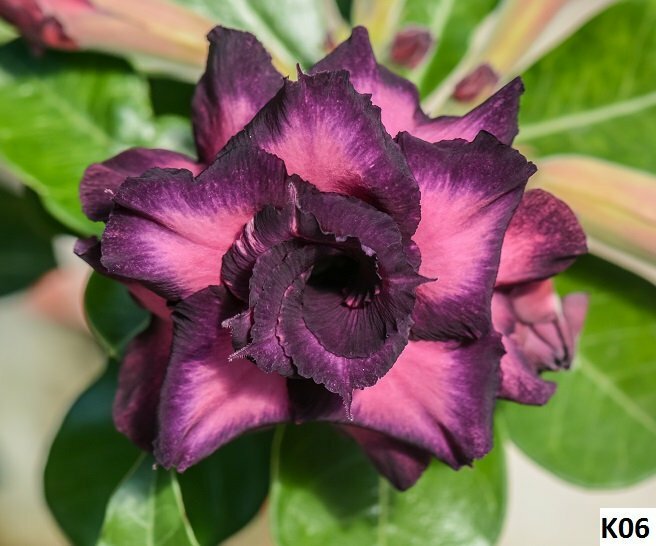 If it’s extremely hot and bright where Adenium is, you can water it almost as much as during summer.